The upper part of these shoes is Elk suede leather, and it is simply amazing, and has to be felt to know just how soft it is. I have never felt leather like it before. 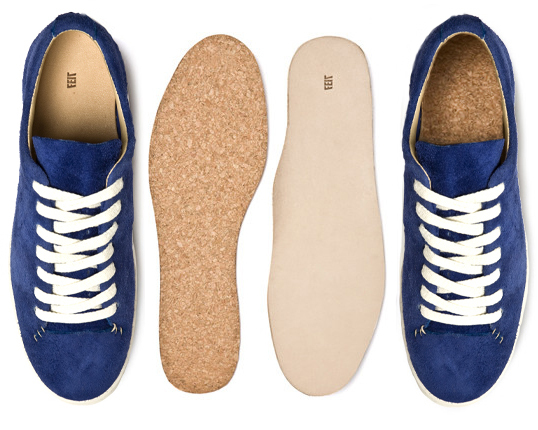 The guys at FEIT always use the finest materials, and with these shoes, they have outdone themselves. Did I mention these are soft? The Elk suede leather is for most part unlined. They have used a couple of pieces of calf skin leather just to ensure the shoes hold there shape and around the eyelets for the laces. The uppers look to be made from a single piece of leather, and that makes sense, as part of the philosophy at FEIT is to minimise waste. They do batches of shoes as a single batch to maximise the use of the available leather, and to cut down on waste. This also means each batch truly is a limited edition. As I am quickly discovering, the quality of workmanship in FEITs hand made shoes, is simply as good as it gets, and these shoes are no exception. The guys at FEIT are always saying to wear the shoes without socks, but I have never been a no socks kinda guy…. till now. I hadn’t tried it with my first pair but did the first time I put these shoes on, and I now don’t were socks with my other pairs of FEITs either. I now can’t imagine having something between my feet and these amazing shoes. The leather is breathable so your feet stay comfortable, regardless of temperature, and although I have never had an issue with smelly shoes, they also say it won’t be an issue with any of their shoes. One thing that has surprised me with all the FEIT shoes I own is how light they are. These shoes feel like I am walking on clouds. The foot bed has buffalo leather liner with a bed of natural cork underneath, and the out sole is made of Lactae Hevea all natural rubber, raw rubber wrap. I am not sure what that last bit is (as its taken directly from FEITs website), but I do know it makes the shoes a pleasure to wear. I could happily wear these shoes all day everyday, but I don’t. These are saved for special occasions. I want them to last forever(and no doubt they will anyway), so I only wear them now and then. Sometimes I come home from work and my feet are sore, so I will put them on. Other times I will be getting ready to go out, and I’ll think this is a blue suede shoe kind of day.